The concept is the brainchild of Henry Hu, a 23-year-old college dropout from Hong Kong, whose love of coffee is intertwined with his entrepreneurial spirit. A new coffee revolution has begun at Cafe X inside the Metreon in San Francisco, where a robot barista will whip you up a latte in seconds flat—and thankfully, it won't do it in a fedora. Cafe X—though actually a kiosk, not a cafe in the traditional sense—opened its figurative doors in February of this year, with a sister location in Hong Kong. 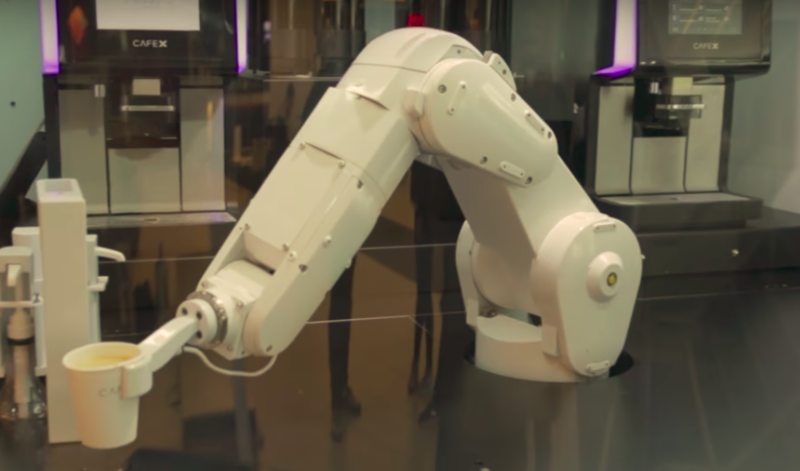 The robot, Gordon (as he's referred to by the developers), is a modified Mitsubishi industrial arm who served more than 400 cups of coffee on his (its?) first outing. The concept is the brainchild of Henry Hu, a 23-year-old college dropout from Hong Kong, whose love of coffee is intertwined with his entrepreneurial spirit. During his second year at Babson College, he left, sold his car, and began pursuing the project full time. He says he initially raised between $100,000 and $150,000 for a prototype. Additionally, he's become the recipient of a Peter Thiel Foundation (yup) grant of $100,000 dollars, which is awarded to young entrepreneurs. Hu stresses that although efficiency is at the core of Cafe X, it will not compromise the quality of the coffee itself. "If an espresso is supposed to be a 25-second extraction and you do that in eight seconds to be fast, then you just get a terrible espresso. That's not what we do," he says. The startup's commitment to serving quality brews is clear from their roasting partners, which include Santa Cruz-based Verve Coffee, AKA Coffee from Oakland, and Berkeley's own Peet's Coffee, which has been roasting beans for over 50 years. Cafe X's current menu reflects a novel simplicity, and a nod to the days of yore, before venti pumpkin-spice lattes and salted-caramel Frappuccinos began masquerading as "coffee." There's an espresso or americano for $2.25; a cappuccino for $2.75; and a minimal selection of other options. Right now, customization options are limited. There are three flavored syrups (vanilla, hazelnut, and caramel), as well as a simple sugar syrup that can be added to the drinks. The increments of syrup can also be changed—low, medium, or "insane." While that does allow for a bit of personalization, it's nothing compared to the freedom offered at other cafes to do pretty much whatever you like, but Hu is fine with that. "We're really quite focused on delivering the recipes that the roasters have created, and doing that in the best possible way for the coffee to taste," he says. "From that point of view, we may actually have less customization than maybe other cafes, or Starbucks, for example. But, what you will get with Cafe X is really the flavor of the coffee that the roaster intended." The setup of Cafe X is simple: Use the dedicated app, or order in-person using a touchscreen at the kiosk. You'll receive one notification on your phone with an estimated wait time for the order, and finally a second one notifying you that your order is ready. Gordon can make two drinks at a time, each one taking between 25 and 55 seconds. Obviously, waiting in a line is going to affect that experience. However, Hu believes that the savvy, everyday user that orders through the app will spend just ten to 12 seconds on site to pick up their awaiting beverage and continue on with their day. If this all comes across as a bit sterile—maybe you're yearning to be greeted by a spunky twentysomething at 7AM as you shamble for your morning brew—fear not; there is a human component. Cafe X is intended to be manned by at least one to two "product specialists" at all times, employees that Hu characterizes as a cross between a sommelier and an Apple Store Genius. Product specialists will inform customers about the stand's coffee offerings, order free flights of espresso for curious customers, and basically just "do many of the things that a barista would typically do, minus the 'move cups around' part," says Hu. Moving cups around happens to be something robots can do extremely well—and that's why Hu thinks coffee service makes a great platform for a partnership between automation and human hospitality. As robot workers become more prevalent in certain parts of the foodservice and hospitality industries, the question remains, will there be a need for human interaction, and if so, what will they offer? With an emphasis on a sometimes cold efficiency, Silicon Valley's forays into food technology have been spotty; Cafe X could change that perception. "The company does not exist to invent as many robots as possible, to replace as many jobs as possible; the company exists to have a really great coffee experience." If nothing else, a robot won't misspell your name or tell you you're going to get diabetes on your coffee cup—but maybe that's part of the charm of human interaction.